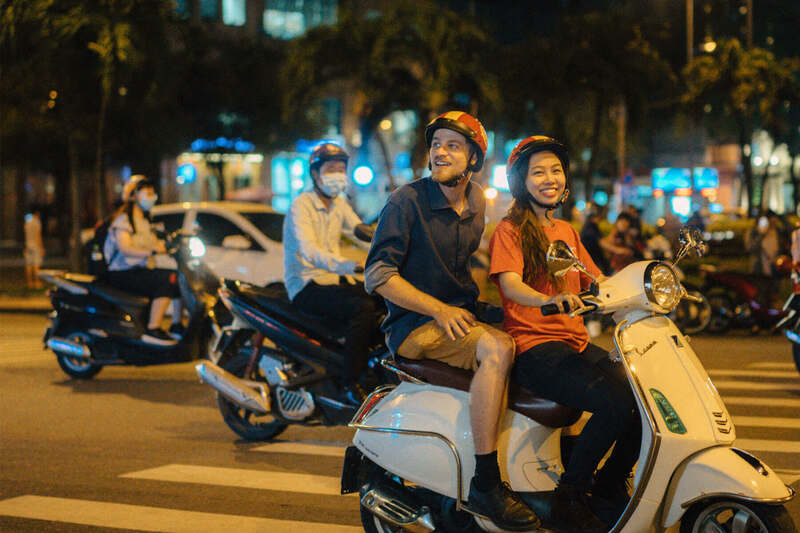 Ho Chi Minh City Tours: Top 6 Ho Chi Minh City Tour Options with Back of the Bike Tours for travellers to Ho Chi Minh City. Wake up early to experience a Ho Chi Minh City Tour while the day is still nice and cool during the morning hours. Of course, the residents of this wonderful city are up and at em very early to get the day started. We like to start our Ho Chi Minh City Tours in the morning with a lovely fresh cup of coffee or smoothie.From there our Ho Chi Minh City Tours in the morning venture off into the streets to make our way to the famous Post Office located in the center of Ho Chi Minh City District 1.The next stop on our Ho Chi Minh City Tour in the morning will be a stop at a local wet market. This is one of the most immersive expereiences that on any morning Ho Chi Minh City Tours that are being offered by tour companies.After the local wet market, our Ho Chi Minh City Tours in the morning like to take our customers out to experience China Town at a local temple. Our Ho Chi Minh City Tour in the morning will make stops in Districts 1, 4, 3, 5, and 10. Please book one of our Ho Chi Minh City Tours in the booking form below or be sure to contact us! We get the question about whats the difference between the Morning and Afternoon Ho Chi Minh City Tours that we offer. Our Ho Chi Minh City Tours offered in the morning are the same in the afternoon. The reason why we have two tours is that when customers are travelling sometimes the afternoon time frame works better for them so we offer this time frame for bookings. Our Ho Chi Minh City Tour in the afternoon will make stops in Districts 1, 4, 3, 5, and 10. We do not take bookings for 1 person tours on the our Ho Chi Minh City Tours in the afternoon directly on our booking form. Please contact us directly on our contact us page and our secretaries would love to get your tour booked for our Ho Chi Minh City Tours in the afternoon. Our Ho Chi Minh City Tours via motorbike are so great because we can really get into the cracks and nooks of Ho Chi Minh City. When you book a street food tour in saigon, you really want to get into these spaces because this is how you experience the real street food. This is exactly what our Ho Chi Minh City Tours Afternoon Motorbike food tours do. We are gonna show you some of the best street food that other Ho Chi minh City Tours food tour companies don't even know about! Our Ho Chi Minh City Tour in the afternoon will make stops in Districts 1, 3, 8, and 10. Please book our Ho Chi Minh City Tours in the booking form below or contact us directly via email! Can we book your Ho Chi Minh City Tours if we have allergies? Our Ho Chi Minh City Tours have been able to handle many allergies over the years, just please be sure to let us know your allergy in the booking form when making your Ho Chi Minh City Tour booking. The night time is the right time for a food tour! Our Night Ho Chi Minh City Tours is some of our most popular options over the past few years. The weather is a bit cooler at night, and in Vietnam going out to eat is our main night time activity. Our Ho Chi Minh City Tours on motorbike checking out local Vietnamse street food is a great option for any traveller! Our Ho Chi Minh City Tour will make stops in Districts 3, Phu Nhuan, 5, and 10. We do our best to accomodate our Ho Chi Minh City Tours to guests who want to take a car for their Ho Chi Minh City Tours. We understand that a motorbike isn't for everyone.If you want your Ho Chi Minh City Tours to be offered by vehicle, then do not hesitate to let us know and we can discuss the price/options via email. A Ho Chi Minh City Tour in a car will feature unique routes depending on the traffic. Contact us so we can discuss the pricing and route for your Ho Chi Minh City Tour Booking via Car! Private Car Street Food Tours are some of the most popular Ho Chi Minh City Tours that we offer. We do tell our customers that the afternoon is a better time for Ho Chi Minh City Tours via car because the traffic is lighter and it allows us to get into more smaller spaces in the city to try delicious street food. This depends on what is discussed during the booking process as a private tour can feature unqiue routes. Contact us to discuss your private car Ho Chi Minh City Tours options! 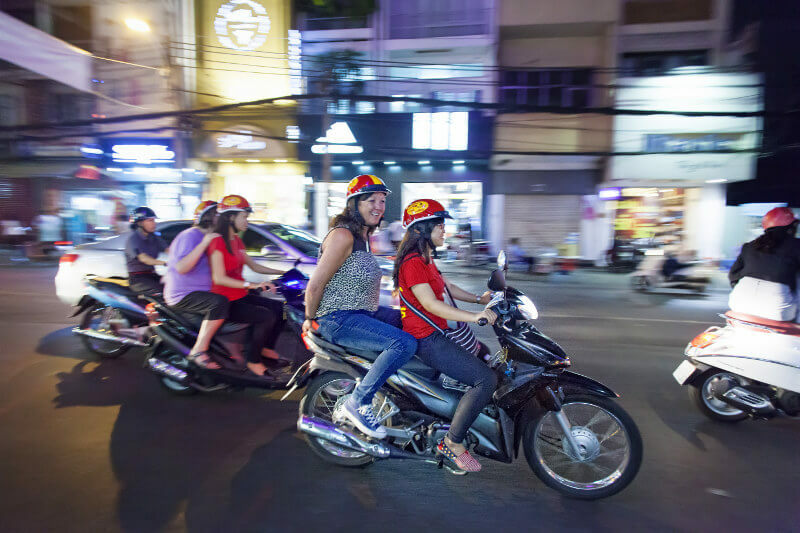 Ho Chi Minh City Tours can have very diverse options depending on which tour operator you choose but Back of the Bike Tours operates most of our Ho Chi Minh City Tours via Motorbikes. Ho Chi Minh Tours don't get better than being on the motorbike. When you are experiencing ho chi minh city on the back of a motorbike you can just feel the city vibrating around you. The smells and feeling of Ho Chi Minh City is literally at your finger tips. Our Ho Chi Minh City Tours are divided into three types Ho Chi Minh City Tours with Sights, Ho Chi Minh City Tours with Food, and Ho Chi Minh City Tours that are private. 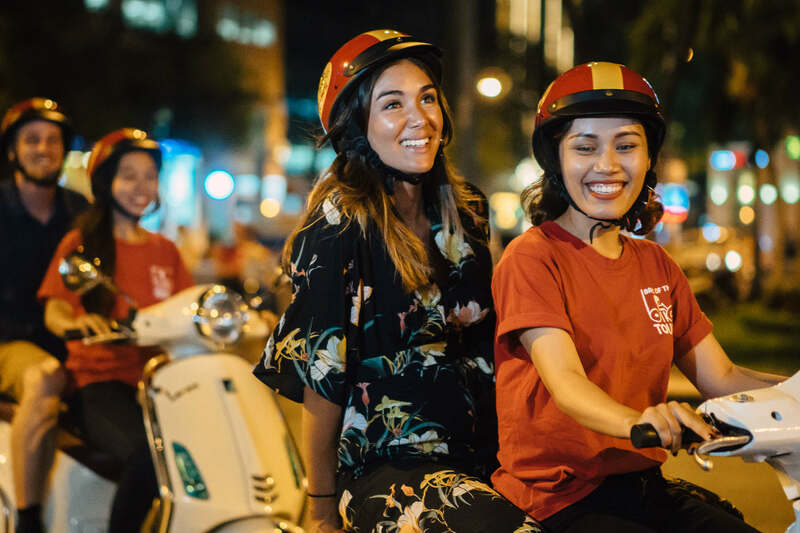 Ho Chi Minh City Tours with sights could be the best option for the traveller who wants to book Ho Chi Minh City Tours that can quickly show them the best Ho Chi Minh City has to offer during a quick tour around the city. A sights tour can become a bit boring if a tour operator isn't as experienced with Ho Chi Minh City Tours with sights like us at Back of the Bike Tours. Our sights tours will dive into the culture of the people of Ho Chi Minh City as well as providing information about the different areas of Saigon. Our Ho Chi Minh City Tours with sights are best booked via a motorbike tour but if you would like to visit the city in a car or van we can do our best to accomodate. If you want to book a Ho Chi Minh City Tour with sights you can check out our Saigon City Tour and experience why our customers say that their Vietnam Tour Guide was the best! Ho Chi Minh City Tours with Food has to be the most popular type of Ho Chi Minh tour that is booked by travellers coming to Vietnam. Since food shows have let customers know about the delicious expectations of Vietnamese Food you can't visit Vietnam without looking for Ho Chi Minh City Tours with food. Ever since the late Anthony Bourdain came to Vietnam during his first show "A Cook's Tour" the visitors to Vietnam have all been looking for the same type of Ho Chi Minh City Tours with food experience that he had. Our tour company even took our a Master Chef on our Saigon Food Tour who absolutely loved her experience with us. Curious about what you jsut saw? Ask questions and get great information from our English Speaking Team Members. 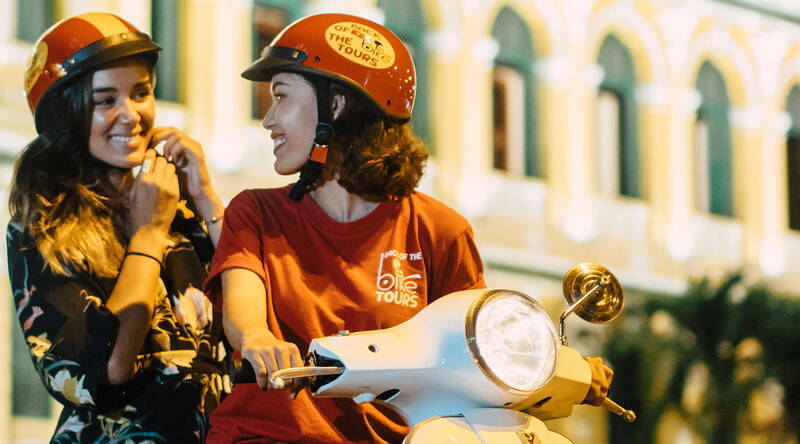 Explore Ho Chi Minh City when the sun goes down and colorful lights paint the streets with our Saigon Night Ride Tour. Experience so much of Ho Chi Min City in just 3 hours that after you’re done you’ll feel like a local. These aren’t the sights you see in guidebooks that everyone knows but an authentic night out in Saigon. You will zip down main boulevards, through tight alleys, busy markets, hidden gems, and other popular locations on the back of a motorbike driven by our English speaking guides. This cultural tour includes stops like Turtle Lake, Thu Thiem City Skyline, and Le Van Tam Park in the City Center. Along the way you can Mot, Hai, Ba, Yo (cheers) with a beer and taste a delicious green papaya salad. 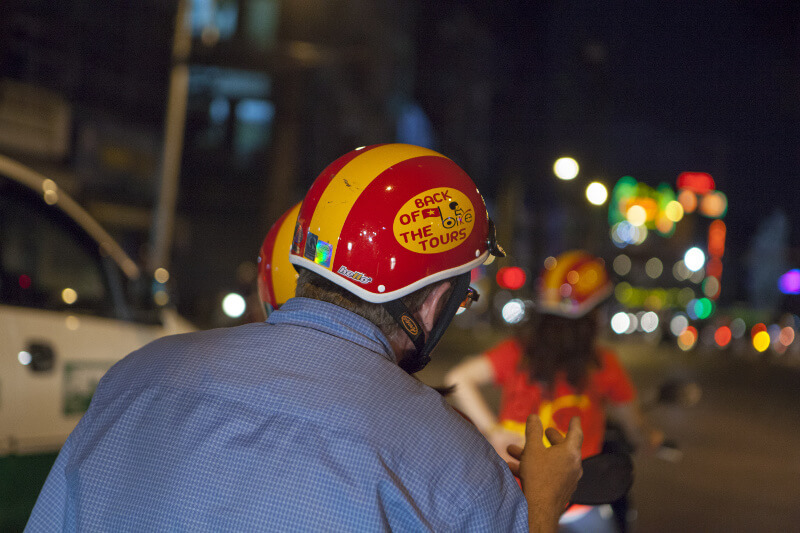 Hop on the back of the bike and experience our Saigon Night Ride Tour. If you only get to do one thing in Saigon…..DO THIS TOUR! We had been recommended this tour by a friend and it was well worth doing. The guys at BOTBT were so easy to deal with and were waiting for us, bright and early at our hotel on the morning of the tour. We took the City Tour and really loved the experience. The tour guides are true professionals and will cover interesting details about Vietnam and life in Ho Chi Minh. Really pleasant, courteous, professional and safe riders and we are already planning to do the Food Tour on our next trip. Excellent way to tour Ho Chi Minh City! First of all, the tour company allowed us to customize our tour so that we combined the city tour with the food tour. This was great because we were able to maximize our time and were able to visit places not normally included in the regular tours. The bike drivers were skilled and confident, which was a great comfort to non-bike rider me. They were also fluent English speakers, so we had great fun interacting with them. We learned much about the city and the cuisine, gorged ourselves on the local food. Highly recommended! We had a wonderful experience traveling around Ho Chi Minh City. Thoa1, Uyen2 and Thien were so friendly and informative. By the end of our tour we felt as though they were old friends. We felt very safe on the back of their bikes. They took us to some amazing out of the way places and told us many interesting facts. We stopped for refreshments and felt like locals having traditional drinks and fruits. An added surprise extra was having Thien ride beside us and take photos. Back of the Bike Tours emailed us 84 photos from our tour! Many of the photos we would have been unable to take ourselves. I would highly recommend this company and tour. On our next visit to HCMC we would like to do the food tasting tour. Thank you for a wonderful experience. Best tour in Ho Chi Minh City! An exhilarating experience! My husband and I thoroughly enjoyed this tour. I would like to make special mention of my guide, Phuong4, who skillfully guided me through the streets of Ho Chi Minh City. Her english was excellent and she gave me a lot of information about the city. My husband’s guide, Vuong, was also excellent and very knowledgable, as were all the girls who guided the group through the City. Brilliant tour! We toured Saigon on the back of the bike food tour 3rd May 2017. An excellent day and one that we will never forget. Myself and three friends booked the tour over the net before we travelled to Vietnam. I must say on watching youtube video’s of the roads in and around Ho Chi Minh City we were more than a little worried about what lay ahead, however once we met our riders and were reassured about their experience of riding bikes in the city we felt better. Our first stop was after about 10 to 15 minutes. we were treated to a street side meal of traditional vietnamese food. The girls were very informative and attentive to us, explaining each dish and ingredients, even giving instructions on how to use chop sticks(I struggled with this). for the next four hours we navigated the “mad mad” traffic in Ho Chi Minh city with constant information about each attraction and landmark. The skill of our riders on the road to navigate around thousands of scooters was breathtaking never once giving use any concerns about their ability. We made several more stops on route around the city for all kind of delicious street food ranging from noodle dishes to fish dishes to meat dishes to ice cream. I felt safe at all times during the tour and would definitely recommend the trip. Great Experience! We did the night food tour and the next day we did a private city tour. Both tours were super fun and we had great guides. They all spoke English well. I felt safe on the motorbikes and enjoyed zipping around the city this way. All of the food was excellent! This was a great way to experience life in Ho Chi Minh City! The food tour is a great way to experience the food of Vietnam but there is food on the City Tour as well - you go to a coffee/fruit smoothie bar first, then the wet market where you can try some fruit and other treats, then after a few other stops they take you to lunch - you can even pick the type of food you'd like and they will find a place for you (this might be only offered on the private version of this tour). They were very accommodating! I would do these tours again. We did the night food tour and the next day we did a private city tour. Both tours were super fun and we had great guides. They all spoke English well. I felt safe on the motorbikes and enjoyed zipping around the city this way. All of the food was excellent! This was a great way to experience life in Ho Chi Minh City! The food tour is a great way to experience the food of Vietnam but there is food on the City Tour as well – you go to a coffee/fruit smoothie bar first, then the wet market where you can try some fruit and other treats, then after a few other stops they take you to lunch – you can even pick the type of food you’d like and they will find a place for you (this might be only offered on the private version of this tour). They were very accommodating! I would do these tours again. The Back of the Bike tour is a great way to see Ho Chi Minh, we went on the city tour on the morning of our first day as a way to get our bearings around the city. We are a family with 3 Children (11,9 and 5) and the boys loved the tour. We felt safe and had immense amounts of fun. The staff are very knowledgeable, exceptionally friendly, good fun and command of English is excellent. We did the city tour in the morning and I would recommend it to anyone who visits Ho Chi Minh City. The drivers/guide are fluent in english and easy to talk to. They are very good drivers and for extra safety there is a driver (wingman) that follows you taking photos. With limited time I had in Ho Chi Minh City, I stumbled on this tour through trip advisor. I found it easier to just book both city and street food tour together and I thought it was such a great experience. For the city tour, I booked the 8am tour that lasted four hours. The tour guides were very informative about the different sites around the city. We also rode through some back alleys that can barely fit the motorbike and see the community within the city. Also did a tour of the wet market and able to see what it was like for locals to buy all of the food from vegetables to spices to fish and meat. We took our time throughout the city tour with small breaks like learning how to make Vietnamese coffee, trying fried fish cake in the market and a tasting a platter of various exotic fruits from Vietnam. For the street food tour, I booked a 6pm street food tour that lasted four hours. It was a rather large group but they split everyone up with each tour guide. I was completely stuffed to the max with the amount of different kinds of food we tried. They educated us on how different the food can be in the various regions of Vietnam. They frequently offered drinks/beers along the way. They had a photographer the whole time to capture moments of people zipping around the city in the motorbikes. The night tour was totally worth it to see the city in a whole new light. I would recommend doing both of these tours again when visiting HCMC.